Location/ Directions: Rt. 29 Northbound, exit 6. Turn left at stop sign. Take 2nd left onto Stadium Rd. Hotel is on the left. Rt. 29 Southbound, exit 4, Hotel is on the left. 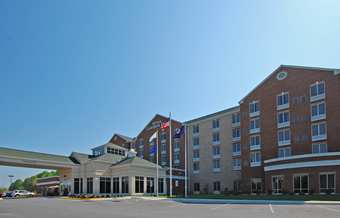 About Hotel: 2-Floors, 47-Rooms, Exterior Corridors, Free Continental Breakfast, No Pets Allowed, Outdoor Parking, Cable/Satellite TV, Free Local Calls, Free Wireless High Speed Internet Access, Refrigerator. Railroad View: Poor View from window. Good view from exterior corridor. The railroad view includes train entering & exiting a high steel tressel. Railroads past Hotel: Norfolk Southern. 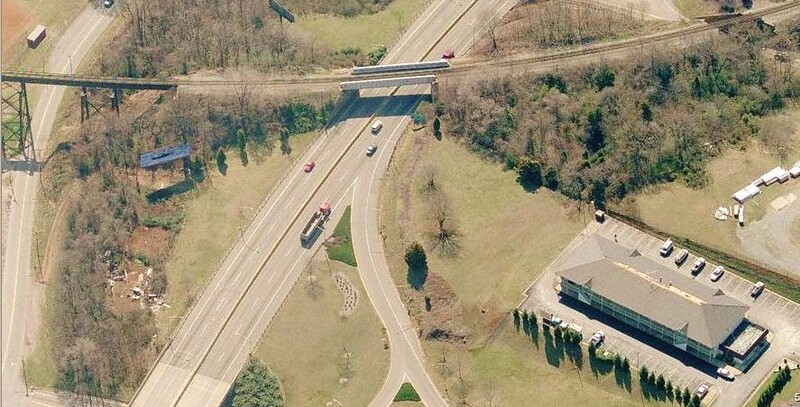 Photo Comment: The Econo Lodge motel is see to the lower right in the aerial picture. Although the rooms don't have a direct view of the railroad due to trees in the way, an exterior corridor provides convenience to see the passing train's much easier. About Hotel: BRAND NEW. 4-Floors, 106-Rooms, Interior Corridors, High-Speed Internet, Pets not allowed, Air conditioning, Alarm clock, Coffee maker/tea service, Crib, Individual climate control, Iron and ironing board, Mini fridge, Hair dryer, Color Cable/satellite TV with HBO/ESPN/CNN, Microwave oven, Silverware, Phone with voice mail, Coffee in lobby, Coffee/tea in-room, Continental buffet Breakfast, Full-service business center, Fitness Center. Railroad View: Excellent View. Any room on the rear of the motel will give you a railroad view. 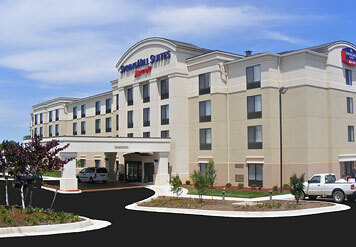 Photo Comment: The aerial photo shows the SpringHill Suites near the center top of the photo. The double track railroad runs along the bottom part of the photo. This photo looks westward, meaning best lighting for photography from the hotel will be in the afternoon hours. Expect a clear view of the railroad from upper floor rooms. Location/ Directions: Hwy 29S Business to Exit 1 - Main St.
Iron & Board Available In Most Rooms. Railroad View: Fair to Poor View due to some tree's & brush. 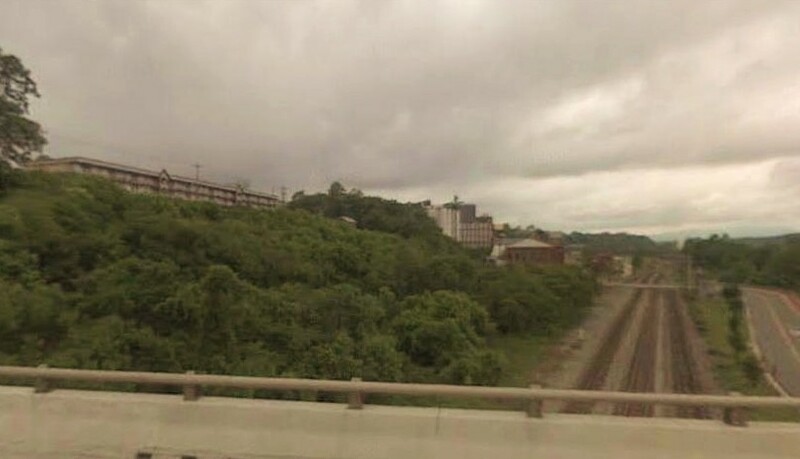 Photo Comment: The picture taken from the Lynchburg Expressway Bridge (US-29 Business) looks north down the Norfolk Southern tracks. The Travelodge motel is the building to the upper left (above the tree line). A room on the third floor may give you a railroad view, if in fact you can see over the tree's. 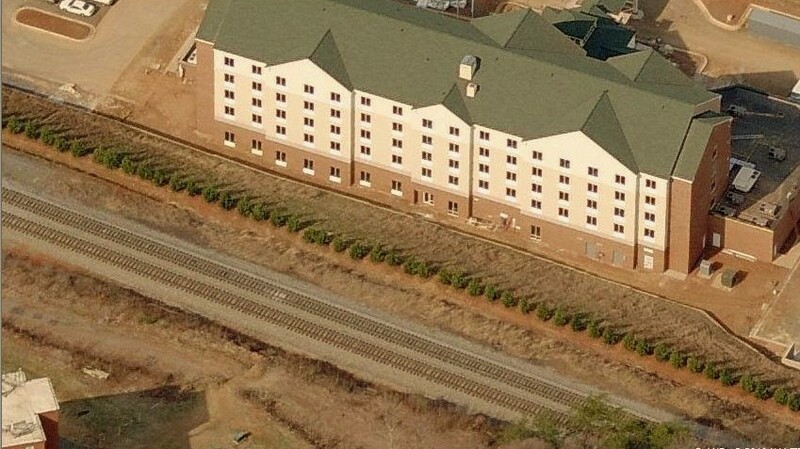 Until we confirm the view from this property, we recommend the other motel's listed in Lynchburg with a railroad view. About Hotel: BRAND NEW. 5-Floors, 126-Rooms, Interior Corridors, No Pets Allowed, Complimentary Parking, Air Conditioning, Black-Out Curtains, Clock Radio w/ MP3 Connection, Ergonomic Mirra Desk Chair, LCD Flat Panel TV with HBO/ESPN/CNN, Thermostat (adjustable), Work Desk with Adjustable Lamp, Coffee Maker, Evening Room Service Available, Hairdryer, High Speed Internet-No Charge, Iron/Ironing Board, Microwave, Mini Refrigerator, Newspaper M-F (USA Today), Self Laundry Available, Telephone with Auto Wake-up, Speakerphone and voice-mail, 24 Hour Pavilion Pantry, ATM, Bar Area, Elevators, Gift Shop, Local Area Transportation, Lounge, Luggage Hold, Multi-Lingual Staff, On-Site Convenience Store, Room Service, Snack Shop, Business Center, Fitness Room, Pool, High chairs, Cribs, Dining on-site. Railroad View: Excellent View! At least until the newly planted evergreen tree's get tall. Motel right next to railroad tracks. Any room on the rear of the building will have an excellent railroad view. Note, some smoking rooms are located on the 5th floor. The entire floor smells like smoke. Avoid this floor if you are a non-smoker. Even room numbers face the tracks. Railroads past Hotel: Norfolk Southern (former Southern mainline) / Amtrak. Photo Comment: The view says it all. Until the tree's grow. (Pictured during construction).